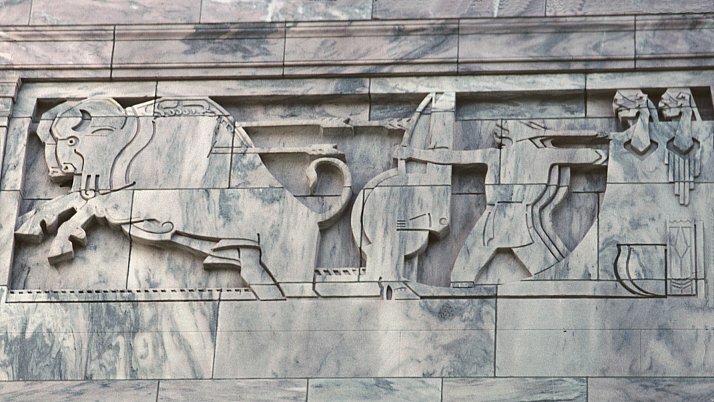 Brcin had contracted with the architects of the museum for sculpture of various types, in particular, two free-standing monumental equestrian statues for the main entrance, a long relief panel over the main entrance, panels for the east doors (see door panel), and 8 corner panels, 7 of which are included below. 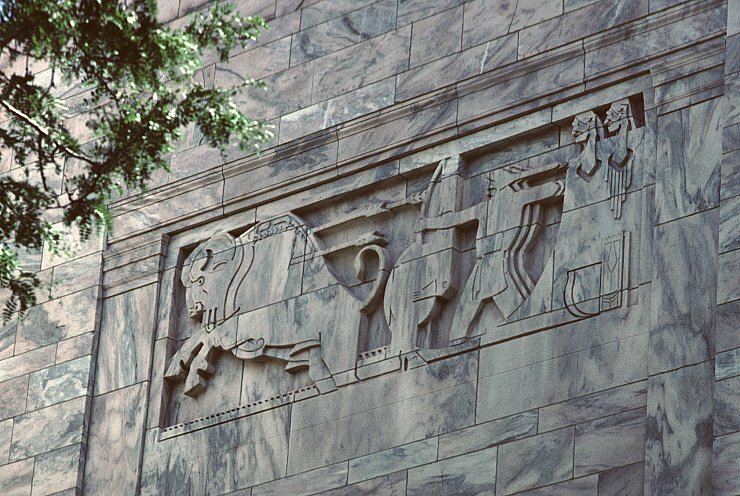 Designs for the equestrian statues and entrance relief panel were rejected, the door designs had to be reworked, and the subjects for the corner relief panels were in part determined by Hartley Burr Alexander, not the sculptor. 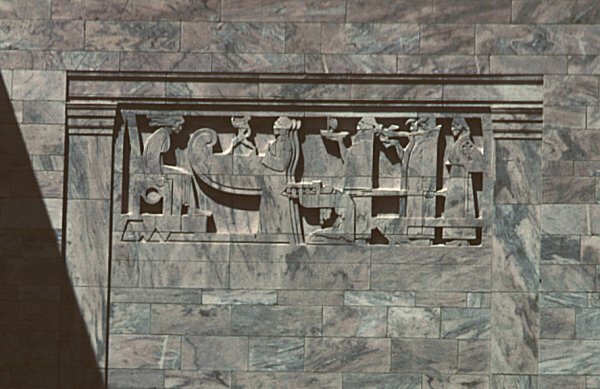 According to Graham W. J. Beal, the final panels reflect "Alexander's view of cultural development in America[;] the eight panels were divided equally between the Native American and the European contributions" (37). Since panels are located on the corners, the arrangement attempts to coordinate the panels thematically; to some extent, then, the corner panels can be viewed as a pair. 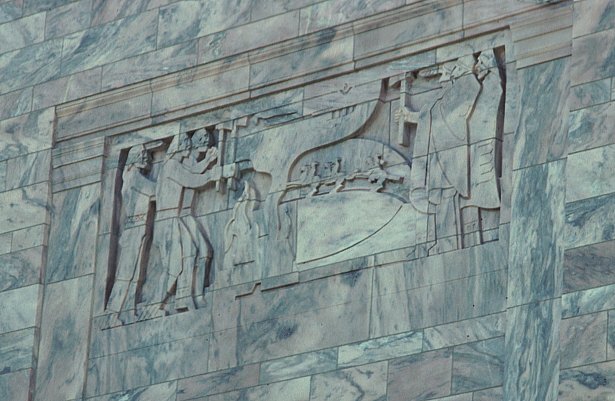 However, the arrangement does separate the contributions of white settlers, occupying the panels on the eastern half of the building, from those representing Indian themes on the western half. The two panels relating to the career of George Joslyn as a newspaper journalist are located at the two corners of the east or main facade. Standing before a personified Intelligence, seated at the left, are figures holding signs for travel--a boat, train, and plane. 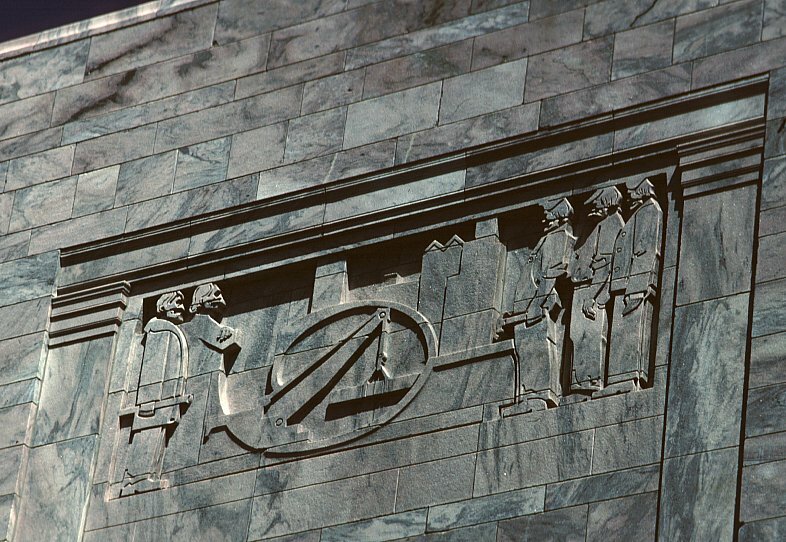 Two other figures hold symbols for the telegraph and radio. 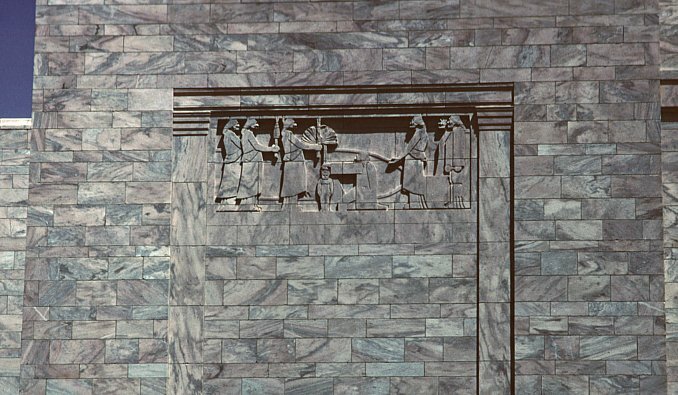 This panel, on the left side of the front facade, is connected with the above. In the center a printer holds up a newspaper page. 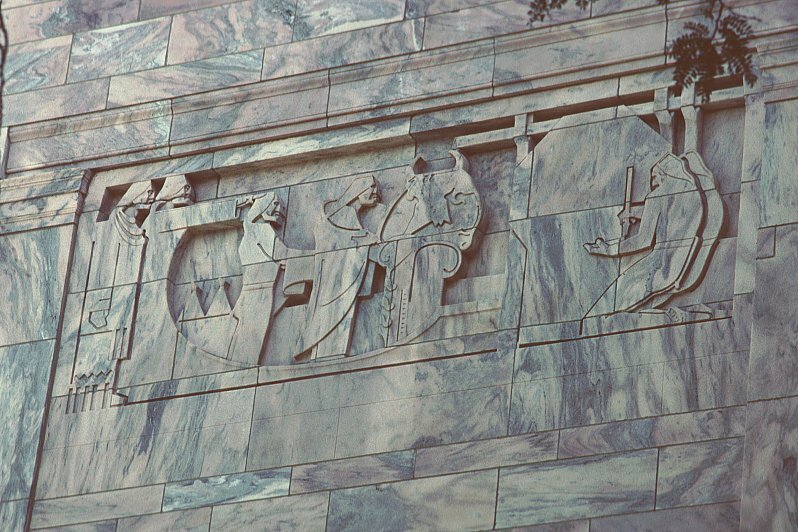 Other figures represent frontier men and women; at the far left a Native American stands (in buckskins). Indirectly the panel below also refers to the career of George Joslyn. 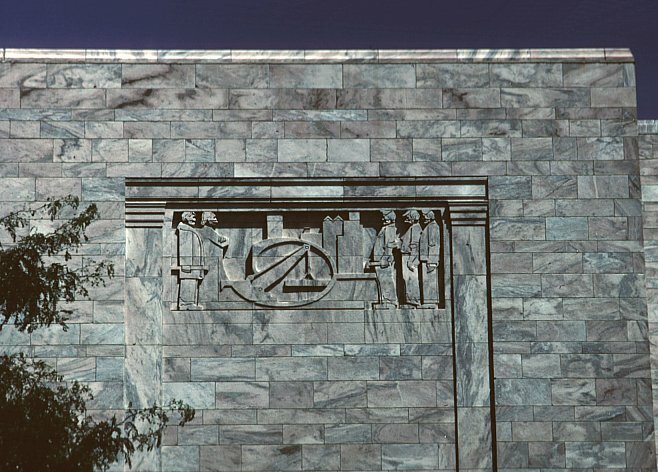 Chronologically after home steading (the subject of a panel not illustrted here), civic building is defined by the construction of cities--pictured in the center of the panel with gabled skyscrapers--and alludes to the building of civic memorials like the Joslyn Art Museum. 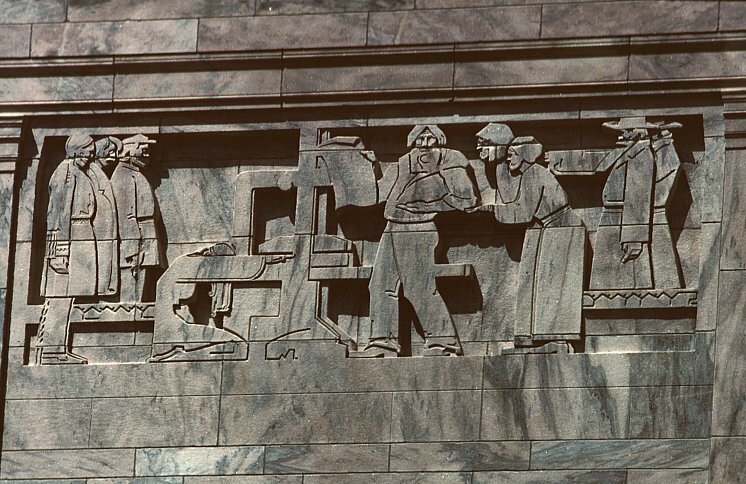 This relief forms a pair with The Homesteaders (not pictured). According to Beal, this panel represent the Hako "blessing the child" ritual. The old man has just lifted the blanket from the boy in the center while other participants watch at each side. Figures on the right make the Indian sign for buffalo. This panel depicts in the center an unprepared hide (prior to the act of writing) and at the right a man sitting in front of a stretched skin ready to write. Three horsemen (enemies) in the center distance indicate the reason for the signal. The Indians on the left suggest a war dance ritual. Return to views of the museum. See also the new addition by Sir Norman Foster. Work Cited: Graham W. J. Beal. Joslyn Art Museum: a Building History. Omaha: Joslyn Art Museum, 1997.